The car park lets the car sleepers enter from 7pm, local public toilets close at dusk. As a result, Barbara says she doesn't drink any liquids after she arrives. In the mornings, she showers at a friend's house. Dressed in clean, comfortable clothes and wearing sunglasses, she is far removed from the stereotypical image of homelessness. "I don't think I fit into anybody's image," she says. "There's going to be lots of homeless individuals who are middle-class, there can't be anything but. We're in an awful mess economically. I don't think we've seen half of what's going to happen in this country." 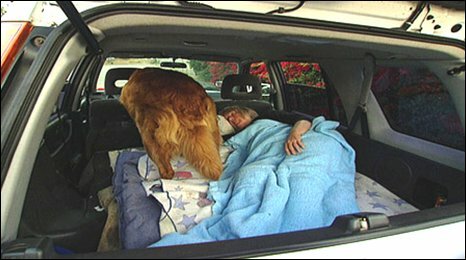 This new phenomenon of middle-class homelessness is hard to quantify, but New Beginnings, an organisation that runs the car park sleeping scheme in Santa Barbara, says they accommodate some 55 people in a dozen parking lots. 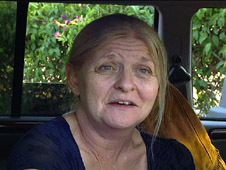 Outreach worker Nancy Kapp, once homeless herself, says there is a waiting list for car park spaces and she is getting more and more calls each day from people about to lose their homes. She identifies it as a new breed of homeless emerging in America. "Being poor is like this cancer, and now this cancer is filtering up to the middle-class," she says. "I don't care how strong you are, it's a breakdown of the human psyche when you start to lose everything you have." "These people have worked their whole lives to have a house and now it's crumbling and it's in ashes and how devastating is that?" she says. "It's not an American dream, it's an American nightmare." California house prices fell by 30% in the year to May. Few parts of America have been hit as hard. But national housing groups say they have seen a rise in homelessness across the US since the foreclosure crisis began last year. 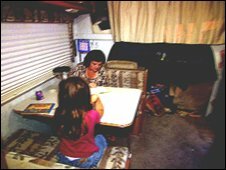 In another car park in Santa Barbara, Craig Miller, his wife Paige and their two children say they feel cramped in the small mobile home where they have been living for several months. "It's hard to keep things clean," says Paige. "It's hard to feel complete and whole." Originally from Florida, the family used to own a four-bedroom house with a pool. But when Craig's business failed, they lost it. Undeterred, the family embarked on a dream to drive across America and make a new start in California. But unable to find full-time work, and unable to afford rent, as Craig puts it "we got stuck". He says it was like a holiday at first but now it is much harder. "Getting money for food, it's not something we've had to think about before," says Craig. As darkness falls on Santa Barbara, the car sleepers settle in for the night. They'll have to be up early: they are not allowed to stay in the car parks beyond 7am. Some work, others spend their days driving from one spot to another. When evening comes around again, they return to their car park homes. In comparison to other countries, and indeed America's own long-term homeless, they are still fortunate. But as America's economic crisis deepens, could there soon be more of them?